In the hype typhoon that encompassed the Apple Watch, another stunning piece of hardware design was introduced to the public during Apple’s Spring Forward event on Monday; the new MacBook. This latest update is a significant breakthrough in professional notebook hardware. As is becoming status-quo in Cupertino, Apple is reinventing technology that we take for granted. For example, the new butterfly keyboard mechanism . It’s different from the traditional scissor mechanism that most every laptop uses currently. They did this to accomplish two goals: Make a thinner laptop. Maintain a full-size keyboard. Mission accomplished. The new Macbook is just .52 inches at it’s thickest, and .14 at it’s thinnest. The new keyboard is much thinner, taking up less space internally, and the keys measure out exactly the same size as your hands are used to on a traditional laptop keyboard. Where’s the tradeoff? Well the keys have less space to move down, so it will feel significantly different in that regard. If you’ve ever typed on an iPad or iPhone screen, then it’s really not that drastic. The weight is also a huge improvement. The new MacBook weighs in at 2lbs. I’m currently typing this on a 11″ MacBook Air that weighs 2.38lbs, and think this is the perfect travel weight. Now the new MacBook shaves .38lbs off of that and makes my messenger bag that much lighter. Anyone who rocks a mobile office knows how important that is. Connectivity is another aspect of this laptop that has taken a drastic step into tomorrow. The new MacBook heavily relies on the wireless technologies that are becoming standardized every day. Bluetooth 4.0 and 802.11a/c run the show here. Any printer that’s worth while has a wireless printing option now. File transfer easily through AirDrop. Connect to a TV for display sharing via AirPlay. Listen to music with any number of bluetooth headphones, or speakers. This coupled with iCloud Drive give you several ways to live without the cord. Speaking of which, the new power cord is a step away from the norm with Apple. The new MacBook is the first laptop Apple has made without a proprietary port. It powers through USB C.
This is a new industry standard technology that will open up several manufactures to create their own devices to connect to your MacBook. It’s not limited to just power. I would expect to see sleek new docking stations to hit the market soon. With all this space saving on the inside of the laptop, there’s plenty of room for battery. The new MacBook boasts “all day” battery which I’m assuming means “all work/school day” since the website claims 9-10 hours battery life. This should be enough for an average day at work, but I wouldn’t leave the house with less than a 100% charge & the power cable handy. (You never know when your workday will be interrupted by a Netflix marathon) Either way, 9 hours of battery life is nothing to be disappointed in. Apple has put a lot of research and development into the inside of this new MacBook and quite simply, it looks beautiful. All of the smooth dark area you see here is battery. The miniature board you see at the top is the logic board which houses RAM, video, and hard drive. 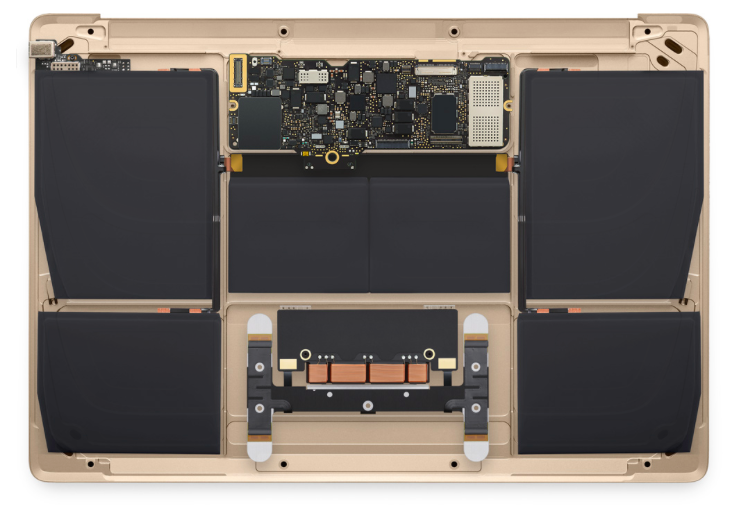 The bottom you see the inner workings of Apple’s new “Force Touch” trackpad. The same technology that will be part of the Apple Watch interface, giving you tactical feedback and a new way of interacting with the web and OS. A sleek new design, extremely power efficient, a stunning retina display, and several uncompromising space saving innovations makes this MacBook, in my opinion, the best new tool for any business person looking for the ultimate portable laptop solution.